Burleigh Arland Grimes (August 18, 1893 – December 6, 1985) was an American professional baseball player, and the last pitcher officially permitted to throw the spitball. Grimes made the most of this advantage and he won 270 games and pitched in four World Series over the course of his 19-year career. He was elected to the Wisconsin Athletic Hall of Fame in 1954, and to the Baseball Hall of Fame in 1964. Grimes was born in Emerald, Wisconsin. He was the first child of Nick Grimes, a farmer and former day laborer, and the former Ruth Tuttle, the daughter of a former Wisconsin legislator. Having previously played baseball for several local teams, Nick Grimes managed the Clear Lake Yellow Jackets and taught his son how to play the game early in life. Burleigh Grimes also participated in boxing as a child. He made his professional debut in 1912 for the Eau Claire Commissioners of the Minnesota–Wisconsin League. He played in Ottumwa, Iowa, in 1913 for the Ottumwa Packers in the Central Association. 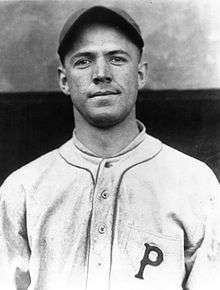 Grimes played for the Pittsburgh Pirates in 1916 and 1917. Before the 1918 season, he was sent to the Brooklyn Dodgers in a multiplayer trade. When the spitball was banned in 1920, he was named as one of the 17 established pitchers who were allowed to continue to throw the pitch. According to Baseball Digest, the Phillies were able to hit him because they knew when he was throwing the spitter. The Dodgers were mystified about this; first they thought the relative newcomer of a catcher, Hank DeBerry, was unwittingly giving away his signals to the pitcher, so they substituted veteran Zack Taylor, to no avail. They suggested that a spy with binoculars was concealed in the scoreboard in old Baker Bowl in Philadelphia, reading the signals from a distance, but the Phils hit Grimes just as well in Ebbets Field in Brooklyn. A batboy solved the mystery by pointing out that Burleigh's cap was too tight. It sounded silly, but he was right. The tighter cap would wiggle when Grimes flexed his facial muscles to prepare the spitter. He got a cap a half-size larger and the Phillies were on their own after that. He then pitched for the New York Giants (1927), the Pirates again (1928–1929), the Boston Braves (1930) and the St. Louis Cardinals (1930-1931). He was traded to the Chicago Cubs before the 1932 season in exchange for Hack Wilson and Bud Teachout. He returned to the Cardinals in 1933 and 1934, then moved to the Pirates (1934) and the New York Yankees (1934). Grimes was nicknamed "Ol' Stubblebeard", related to his habit of not shaving on days in which he was going to pitch. 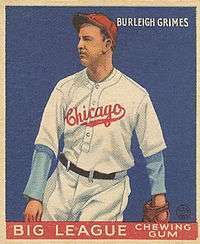 Grimes moved to the minor leagues in 1935 as a player-manager for the Bloomington Bloomers of the Illinois–Indiana–Iowa League. He started 21 games for the team, recording a 2.34 ERA and a 10-5 record. He did not pitch again after that season, moving on to manage the Louisville Colonels of the American Association. Grimes was the manager of the Dodgers in 1937-38. He followed Casey Stengel's term as Dodgers manager. He compiled a two-year record of 131-171 (.434), with his teams finishing sixth and seventh respectively in the National League. Babe Ruth was one of Grimes's coaches. Leo Durocher was the team's shortstop in 1937 and a coach in 1938. When Grimes was fired by general manager Larry MacPhail after the 1938 season, Durocher was hired to replace him. MacPhail said that the team's morale had not been right for a long period of time. Grimes remained in baseball for many years as a minor league manager and a scout. He managed the Toronto Maple Leafs of the International League from 1942 to 1944, and again in 1952 and 1953, winning the pennant in 1943. As a scout with the Baltimore Orioles, Grimes discovered Jim Palmer and Dave McNally. Grimes also assisted in managing the Independence Yankees in Independence, Kansas in 1948 and 1949, where Mickey Mantle started his professional career in 1949. Grimes was elected to the Baseball Hall of Fame in 1964. In 1981, Lawrence Ritter and Donald Honig included Grimes in their book The 100 Greatest Baseball Players of All Time. Grimes died of cancer in 1985 in Clear Lake, Wisconsin. His wife Lillian survived him. ↑ Christofferson, Jason. Diamonds in Clear Water: Professional Baseball in Eau Claire, 1886–1912. Self-published. 2013. p.143-155. ↑ "Robins give Pirates two players for three in big trade; Mamaux obtained by Robins in deal". The New York Times. January 10, 1918. Retrieved November 2, 2014. ↑ Snyder, John (2010). Cardinals Journal: Year by Year and Day by Day with the St. Louis Cardinals Since 1882. Clerisy Press. ISBN 157860480X. Retrieved November 2, 2014. ↑ "Grimes, Burleigh". Baseball Hall of Fame. Retrieved November 1, 2014. 1 2 "Burleigh Grimes Minor League Statistics & History". Baseball-Reference.com. Retrieved December 4, 2014. 1 2 Yannis, Alex (December 10, 1985). "Burleigh Grimes, ex-pitcher and Hall of Fame member". The New York Times. Retrieved November 1, 2014. 1 2 "Grimes back at "home"". Milwaukee Sentinel. February 4, 1972. Retrieved December 4, 2014. ↑ ""Lippy" peps up Dodgers". Pittsburgh Press. October 13, 1938. Retrieved December 4, 2014. ↑ Niese, Joe (2013). Burleigh Grimes: Baseball's Last Legal Spitballer. McFarland & Company. ISBN 978-1-4766-0179-3. Niese, Joe (2013). [Burleigh Grimes: Baseball's Last Legal Spitballer https://books.google.com/books?id=6QKTmVNGltIC]. McFarland. ISBN 0786473282.